A pretty solid piece in the Wall Street Journal on themes we've discussed quite often; essentially as the globe flattens and labor becomes more "disposable" (if you will), structural changes that are little discussed are happening slowly but surely. [Dec 8, 2007: Do the Bottom 80% of Americans Stand a Chance?] All the Great Recession has done is accelerate trends that were already building. Borders will become less meaningful and more people will be forced to move where the work is, and I don't mean within states - but among countries. In my vision of the future this will accelerate - it has happened in many parts of the world (Polish going to Ireland, Philippinos to Dubai) but Americans have been mostly immune. As for America we have a lot of major issues in our employment structure - I cannot think of any other modern "1st world" country where the employer shoulders the health care cost. You simply cannot compete (on cost) on an even playing field with firms in countries where health care is government sponsored. However, since half the country does not wish to have government sponsored health care - the country is in a box. I'm not as sure on the retirement benefit issues in terms of how most other countries do it, but in a general sense there is far more of a "high tax, government sponsored" structure there as well. But even within the US we can see in just 20 years the share of employer v employee has gone from 70 to 30% to nearly 50/50. Is it obvious in any 1 year? No - it's a long term structural change. And that's not even touching on the whole 401k grand experiment, which in my opinion (in due time) will be exposed as a complete disaster. Time has a great cover story on how it has essentially failed (a position we've long held) - we'll post it when we have time. Now we do have some fascinating dichotomies - especially between the public and private sectors. While the private sector has been shedding benefits and shifting the burden to the worker, the public sector has been mostly immune. We harp on this often - this is because private companies actually need to make a profit at some point to stay in business, where government need not - hence the Ponzi scheme aspect of public worker compensation. It has no need to adjust to what the market can bear because the government will either (a) raise taxes or (b) borrow, beg, steal [or print] money we don't have. At some point this discrepency between the 2 main classes of worker will end badly, but who knows when. This can also be seen in retirement benefits - much of the country's remaining pension plans reside in the public sector. As for the private worker? It's going to be a difficult new normal, and again just as the losses of the past 15 years have been slow (i.e. adjusted for inflation median wages are stagnant) and hence not "obvious", I expect the same go forward. I call it "erosion" ... slow and steady losses that are incremental. Until one day you wake up realizing you've been running so hard, but have made no progress. Capital will dominate in this era, and labor will suffer - unless labor is protected (i.e. government). Even going into this recession, I was reading in 2007 how the greatest share of "profits" in US history were going to capital and the lowest share to labor (i.e. wages and benefits) ... I believe it only gets worse from here. The eventual outcomes are variable and potentially ugly as a very bifurcated society emerges. What we can see clearly is Americans will live a more transient work life, at least in the private sector - we can look to Japan to see this same example. [Oct 28, 2008: Pooring of Japan Too?] [Nov 17, 2008: Poverty, Pension Fears Drive Japan's Elderly Citizens to Crime] They will work longer, [Sep 1, 2008: AP - Laboring Longer is Growing Trend for Americans] and for less - wages we pay simply do not make sense in a global competition for many industries. [Sep 4, 2009: Job Seekers Across America Willing to Take Substantial Pay Cuts] They will be required to be far more self reliant for long term savings rather than relying on the workplace for a security blanket. In return for this, they will get cheaper prices for goods at Walmart. So we can talk about recoveries, recessions, expansions, whatever - but under the surface is a far greater structural change. Yes there will be a form of recovery but many jobs in the US have only been created due to bubbles or have no long place in a high cost country and hence will migrate away. [Dec 15, 2008: The Economic "Recovery"] We've tried to hide it to the American people via various asset bubbles - since the many are losing ground in wages/benefits we've tried to inflate their stocks and houses. That only works for so long. But we are on the EXACT same path yet again (perhaps we call this one the government bubble), rather than preparing and adjusting to this new era. What is so sinister about the inflationary campaign our leaders are taking us on, is the #1 way Americans could best cope with the new reality is with a lower cost of living - that means deflation. Deflation in housing costs would be at the top of the list ... while traumatic for current home owners, if the median home price fell another 15-20-25%+ the top cost (rent or mortgage payment) would drop, allowing people to provide for themselves in a far more comfortable fashion for healthcare, retirement, college, et al. Home prices are still out of whack with long term ratios versus income and government is doing every trick in the book to keep it so. [Dec 6, 2007: Analysis - What Should Median Home Prices be Today?] Speaking of college, university costs in the country would be another area ripe for deflation. There are other obvious candidates. But our leaders do not want these things, they believe inflation - the most regressive tax on Earth - is a necessity and in fact a great thing. [Aug 18, 2009: Bloomberg - Deflation Theory is a Lemon We've Been Sold] So the end result will be the need for more and bigger bubbles to fill the gap between what people can provide out of income and the inflationary forces their government helps to push on them. (4) ... while concurrently implementing policies that drive up asset prices in a misguided hope that stock/housing appreciation will make up for the income gap. Apparently not 1 lesson was learned from the previous decade. This Ponzi can continue until step 3 no longer works i.e. the world stops giving government money to continue its policies. Then the government will move to the next step which we've only just begun now, and that is full on printing of money to keep the illusion going. When that fails, it ends badly. Or we could try to address these structural issues through honest, frank discussions - a return to savings - a lowering of cost of living through deflation - and a period of relative discomfort. Nah, forget it. I don't like pain - I'm American; I only deserve pleasure. Just kick the can for another decade... we'll deal with it then. The deep recession appears to be drawing to a close, but not its effect on the workplace. Since the downturn began, thousands of employers have cut pay, increased workers' share of health-care costs or reduced the employer contribution to retirement plans. Two-thirds of big companies that cut health-care benefits don't plan to restore them to pre-recession levels, they recently told consulting firm Watson Wyatt. When the firm asked companies that have trimmed retirement benefits when they expect to restore them, fewer than half said they would do so within a year, and 8% said they didn't expect to ever. Changes like these are reshaping employment in America, injecting uncertainty and delivering the jolting news that pay can go down as well as up. The changes are eroding two pillars of the late-20th-century employment relationship: employer-subsidized retirement benefits and employer-paid health care. Let's separate out health care in its own special section - again let me re-emphasize I don't blame companies, knowing people who run small businesses it is cost prohibitive. I know owners of small biz who do not even have health care for themselves due to cost. It's a broken system. 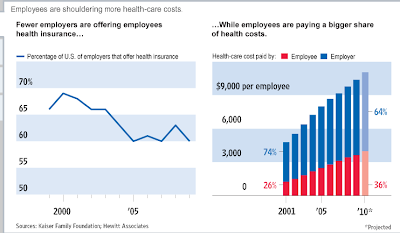 (and partly due to that lack of reform....) The percentage of employers offering health-care benefits is 60% this year, down from 63% in 2008 and 69% in 2000. (more to come) In a survey by Hewitt last winter, 19% of large employers said they planned to move away from directly sponsoring health-care benefits over the next five years. 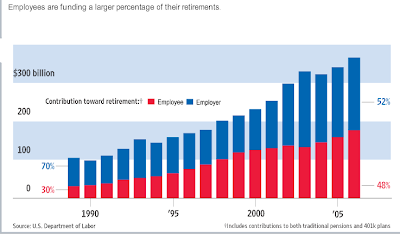 Employees have long been paying a rising share of the cost of their future retirement, as traditional pension plans dwindle. In 1980, employees contributed about 11% of the cost, according to the Labor Department. By 2006, their share was 48%. 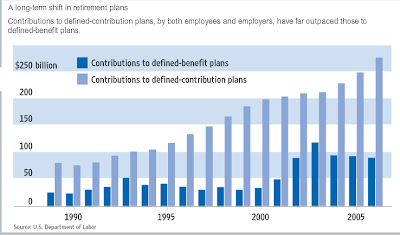 One effect of the trend is to heighten uncertainty, because employers can readily suspend their contributions to 401(k) plans. This year, hundreds did, including some nonprofits. Some shifts in the employer-employee relationship have been building for years, but the recession, by making companies acutely cost-conscious, has accelerated them. 16% of big companies have taken the previously rare step of reducing pay, for at least some, according to the Watson Wyatt survey; 61% have frozen pay. ... Some labor-market watchers think such situations could grow more common as companies tap temporary or contract workers to hold down overhead. (this one should chill you) More than half of 638 chief financial officers surveyed by a Duke University professor, John Graham, said they expected their companies to employ fewer people in 2012 than in 2007. Cursory anecdotal example - ask around, there are countless people like this in the white collar now. The same who thought it would never happen to them as they clucked at the blue collar who went through the same thing a decade earlier. Bonnie Templeton is living in the new era. The information-technology specialist in Loveland, Colo., went to work for a small sign company last year in a job that pays about $42,000, just over half what she earned in her previous job at a university. Her new employer doesn't offer a traditional health-care plan covering most expenses. It has a high-deductible plan, under which she must pay the first $3,000 of her medical bills each year. Like most private-sector employers today, hers doesn't offer a pension such as the one her 89-year-old father collects via Exxon Mobil Corp. Ms. Templeton hasn't had her job long enough to qualify for the 401(k). In any case, she says, with her reduced pay, she couldn't afford to contribute. "You really are covering your own expenses," she says.